Heliciculture is the process of farming or raising snails. Philippe and Julien Thomas: FranceEscargot Passion. Raising Snails:USA: The Alternative Farming Systems Information Center, National Agricultural Library. USA All the information in one site from raising snails to the legilations on raising snails. Cherasco became the point of reference for the Italian breeding activity. Escargot.fr : Francevotre artisan specialiste de la culture et de la ... Vente de plats cuisin?s d'escargots. Pr?sentation de l'?levage et de l'entreprise. It is important to clean out and treat the snails before cooking it, as snails may eat carrion and fungi. These could contain toxins and be harmful to man. CAUTION! Be very careful before deciding to use the snails from your own back yard or front yard for your next dinner party. Try to ascertain if anyone has used snail bait for eradication of snails in you neighborhood. Your neighbor's may be using snail poison. These snails could then migrate to your yard. REMEMBER! Some snails may only contain very small amounts of poison; so small as to not be lethal to the snail-but there may be enough residual poison that if you consumed enough of these snails IT COULD KILL YOU! If in doubt, Please choose to be snail smart and buy your escargot from a reliable source or collect in known safe areas. These snails are a major pest and many areas use posions; So, PLEASE BEWARE! The old French used to feed their snails, picked up from nature, fine herbs, especially thyme. Because of its antiseptic properties, thyme eliminated the toxins and intensified the meat flavor. There are some reports of snail being farms by the Romans during their conquest of Europe. The snails were fed with flour and wine before they were slaughtered in older to enhance the meat flavor that was served to the emperors. called "vaqueta" in some parts of Spain, measures about 35mm across the shell. Considered both an agricultural pest and a delicacy. Some say that snails with striped shells are not very good to eat . This plus their smaller size make hortensis and nemoralis less popular. Grovesnail, Brown-lipped snail, wood snail,or the Spanish "vaqueta"
The edible European Brown Snail or Brown Garden Snail (Helix asperas), is the common garden snail or French "Escargot" which is considered a pest in gardens and yards all over the USA, especially in California. Also known in France as the Petit Gris or Vineyard snail, it was probably first brought to the North American continent about 1850.
also known as the French "petit gris," "small grey snail," the "escargot chagrine," or "La Zigrinata"
Australia Alert: Have you seen a green snail in your garden, market garden, farm or nursery? If so, ring Agriculture Western Australia on (08) 9368 3336.It is olive green, unmarked and white fleshed. It could be a menace to plants of all sorts. We must stop its spread. 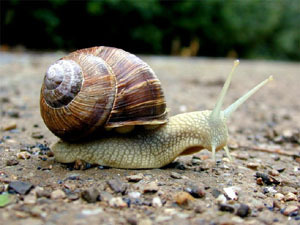 sometimes called the "vineyard snail," "milk snail," or "Spanish snail"
Originally from North Africa and Spain. Introduced to SE U.S., Bermuda, Cuba, and elswhere. 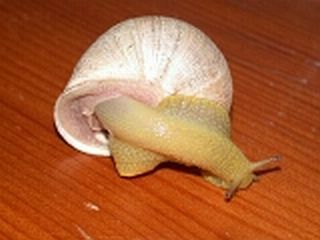 Otala lactea or Helix lactea is popular with Italians, and is sometimes called the "vineyard snail," "milk snail," and "Spanish snail". Turk snail; sometimes "escargo turc,"
this European snail and is preferred by many over Helix aspersa for its flavor and its larger size, as the "escargot par excellence." the "Roman snail," "apple snail," "luna," "La Vignaiola," the German "Weinbergschnecke," the French "escargot de Bourgogne" or "Burgundy snail," or "gros blanc,"
Chocolate Band Snail; Eobania v. or Helix v., the "vinyala," "mongeta," or "xona,"
URL: The snail lives in gardens, hedges, and dunes, where it feeds on vegetation. The snail got its scientific name because the rings on its shell resemble vermicelli (a type of pasta). It is also sometimes called the "noodle snail." native to the Mediterranean region, especially to Turkey and Crete. also called Eobania v. or Helix v., the "vinyala," "mongeta," or "xona"--measures about 25mm. It is found in Mediterranean countries and was introduced into Louisiana and Texas. the Spanish "cabretes" or "xona fina,"
Overcollected as food or populations vanishing due to disappearance of favorite habitats? Native to Sicily, it has been spread to several European countries, including England.